We have been having so much fun with these rolling activities. My older girls wanted something more challenging for them. So for the Christmas Tree I added in some more challenging math addition and multiplication. 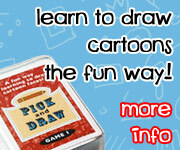 This is such a fun activity to do. 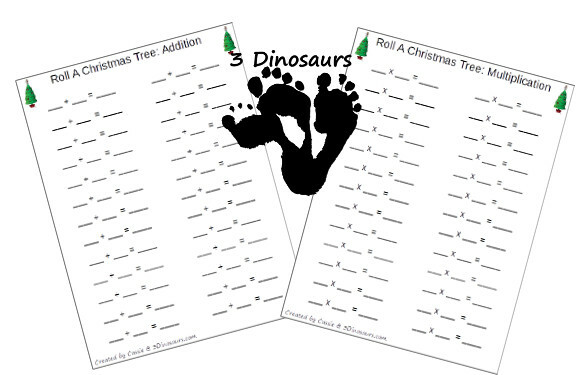 This was a perfect addition to the Christmas printables on 3 Dinosaurs. 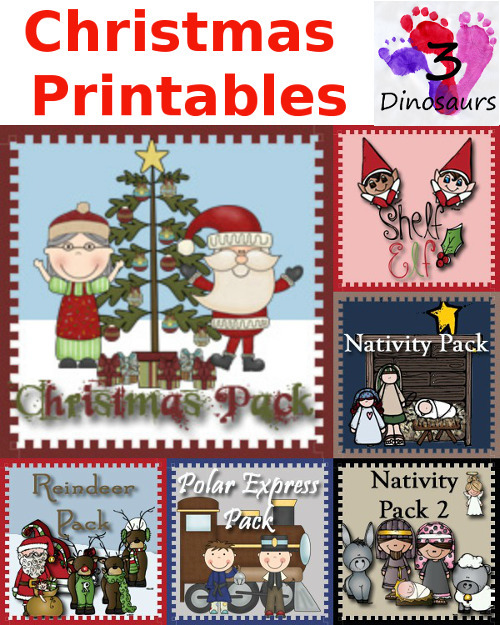 This set of printables will work great with one or two dice or and dice in dice . I really love using the dice in dice so that they only have to do one roll. It is fun for them as well. If you don’t have a die you can print off one in the Free Writing Practice Number Printable. One fun part about this roll and cover is that there a multiple items for each of the numbers. You can add the different ornaments many times. As I have three girls that are working on different learning I try and vary what I make and do with them. Since we are getting into some of the older math skills we needed something that would work on multiplication for my oldest. This set has has multiplication from 1 to 6. It is a great way to review their numbers. There is also a 2 number addition and the numbers add between 2 to 12. There is also a sheet to track the numbers they have used for the multiplication and addition. Christmas tree & 6 decorations. 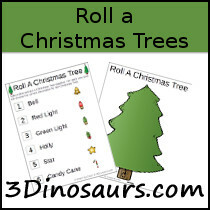 Check here to download the Roll a Christmas Tree! 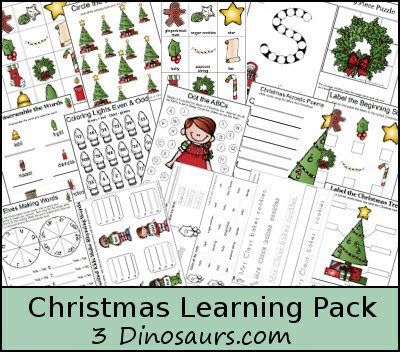 Be sure to also check out the Christmas Learning Pack. 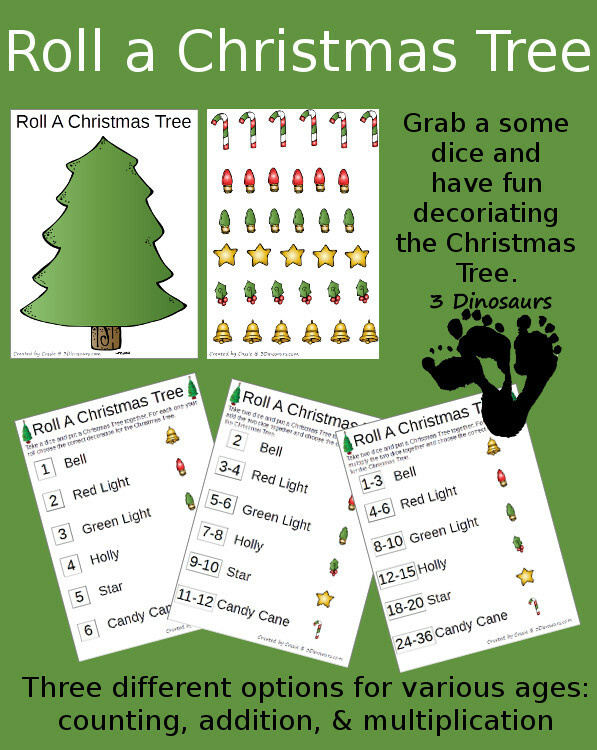 This entry was posted in holiday, math and tagged christmas, free, math, printables. Bookmark the permalink. Adding this activity to our Advent Calendar activity list for this year! Love that I can use it for both 4 year old and 8 year old! Love this for a fun math drill activity! Is there any way to adapt this to work for subtraction as well? Been trying to figure out how to do it. I did recently come up with a way to do subtraction for it. But it takes making some new pages for it. I’m not sure that I’ll have time. But rolling two dice and subtracting the lower number from the bigger number works with a 6 sided dice.